Robert Park - A Modern Telemachus? We need to pray for Robert Park. A professing Christian, the twenty-eight year old Korean-American from Arizona crossed the Tumen River into North Korea on Christmas Eve. Unlike other Christians seeking to aid the people of North Korea, who usually are as covert as possible, Robert Park deliberately announced his crossing to North Korean border guards. He shouted in Korean, "I am an American citizen. I brought God's love." He bore with him a letter to Kim Jong Il, asking the tyrant to open his borders and end his concentration camps. Far from the impulsive gesture of a starry-eyed idealist, Park's move is actually a well-calculated, incredibly brave gamble. He is creating a lose-lose situation for the North Korean leader (similar, on a much larger scale, to Cindy Sheehan's campout at President Bush's ranch). If the North Koreans execute an unarmed man who did not seek to hide his entry, they look bad. If they release him, he will not leave, and if they deport him, he will probably return. Legend says that hundreds of years of bloodsport in the Roman coliseum were ended by Telemachus, who was so horrified by the practice that he ran into the middle of the arena crying, "In God's name, forbear!" and was promptly killed. Robert Park has reminded us that the most powerful people in the world are the people who are not afraid to die. Let's pray that God uses his life to inspire more Christians to noble sacrifices, and to bring freedom to the people of North Korea. Thank you, Kyle, for telling me about this story. My pastor delivers consistently good sermons. But his message on December 13th about the life of pioneer missionary John G. Paton brought tears to my eyes. If you don't see the player below, you can click here to listen. Jesus didn't have to do any of this. He could have never left heaven, never become poor, never died for our sins, sent us all to hell -- and still been perfectly right. He went beyond, far beyond, mere duty. That's why this verse calls it "grace". Jesus could not make us rich without becoming poor Himself. We see this in the connecting word "that". "He became poor, that you through His poverty might become rich." There was no comfortable shortcut to blessing us. Simply sending us messages through the prophets wouldn't do it. Prophets can show us our sins but cannot redeem us from them. 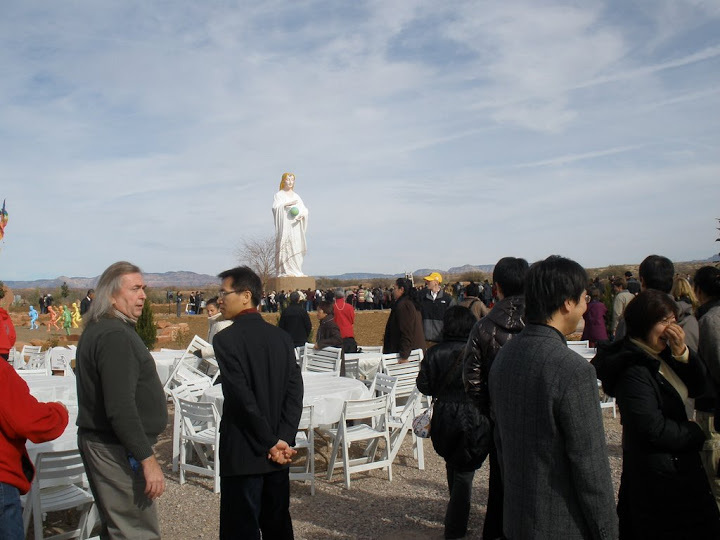 Remember Jesus in the garden? "If it is possible, let this cup pass from Me." It wasn't possible for us to avoid the cup of God's wrath unless Jesus drank it. He did. So we can be rich with the true Treasure, enjoying God for ever. Now I want to take these two points and apply them to us. Jesus incarnated into one Bethlehem. Today, thousands of Bethlehems still wait for an incarnation of Jesus. We who follow Jesus are His body, His representatives on earth. Do you know how many people have never personally met a true Christian? The question is not, "Do I have to go?" If that's our attitude, maybe we're better off staying in our comfort zone. Jesus didn't have to go either. We won't be able to reach the lost safely. We cannot save others painlessly any more than Jesus did. Evangelism by printed page, by TV, by radio, by internet, is good but insufficient. Lost people must see a living, flesh and blood, demonstration of Jesus. Afghanistan and Saudi Arabia and China and India and the many other dark places of the world will not be won to the Crucified solely by words from afar. We cannot make them rich without becoming poor. Your Bethlehem awaits. Will you go? This year my parents and I discovered this touching story called A Quiet Chamber Kept for Thee by Walter Wangerin Jr. Take a few minutes to read and be blessed by it! 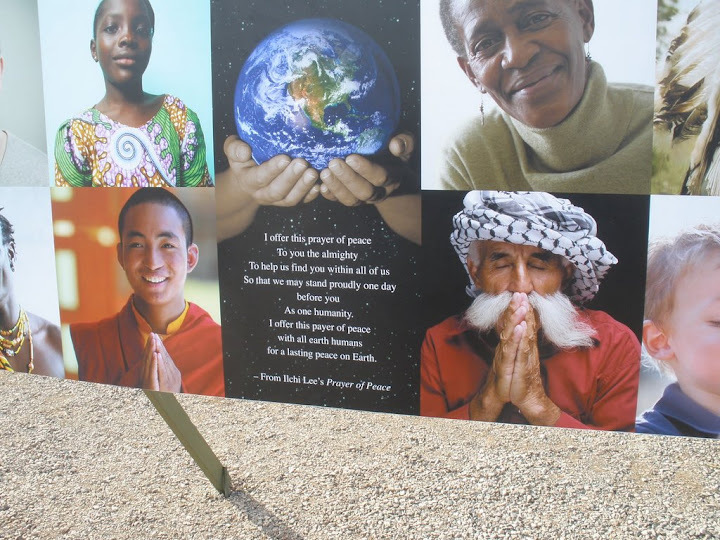 Last Thursday I saw an article in the local paper announcing the grand opening for a 39-foot statue called Mago, the Korean name for Mother Earth. 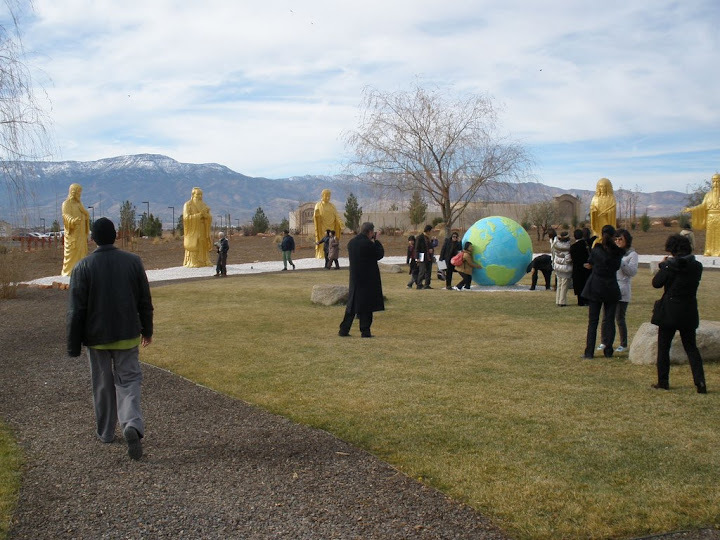 The statue was erected by a Korean organization called the Tao Fellowship. The statue has drawn flak from local residents who feel that it is an eyesore. (It is close to a main highway.) In fact, the City Council will be meeting next Monday to decide whether the statue can stay. The grand opening was today. 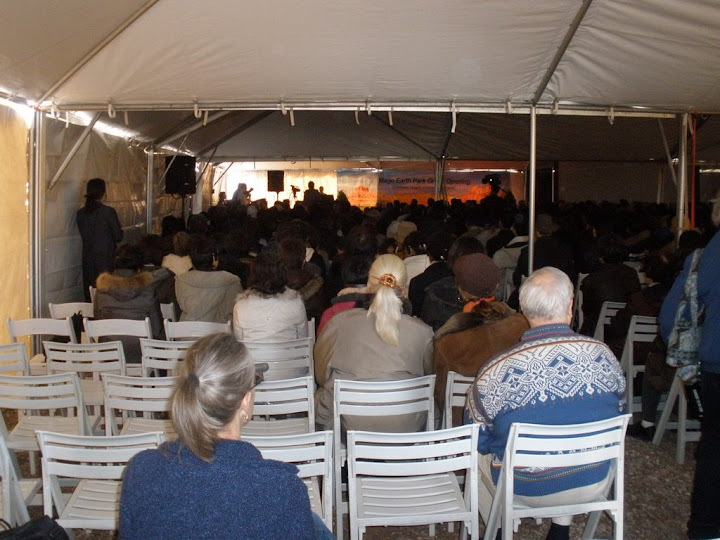 My pastor (Jim Masters) and I decided to go to the event with the goal of telling some of the people there about Jesus. I had never before seen so many people so openly worshipping a false god. This was not subtle religion, this was very public. Knowing that we could not talk to people about Jesus while they were watching the events in the tent, Jim and I walked around the 6 acre park. We walked over to the idol. It was huge, standing roughly 49 feet high (there was a 10 foot base). You can see how small I look next to it. I am holding up my pocket Bible, which tells of the day when Mago and all her followers will bow their knees and acknowledge that Jesus Christ is Lord. But it takes faith to say that. The statue feels very imposing. I can't imagine how much pressure Shadrach, Meshach, and Abednego must have felt when everyone else around them was bowing down to a statue of Nebuchadnezzar twice the size of Mago. In three hours, God blessed us with about 10 good, in depth conversations with individuals. I learned a lot by listening to how Jim shared the good news with people. For some conversations we were together; others, we did separately. It was very easy to bring up the subject of spirituality and religion, as you can imagine. We found that a surprising number of the people we met were from Catholic backgrounds. In the past, I have gotten the creeps or confused when trying to share Jesus with New Age people. This time, probably due to my friends and parents who were praying for me, I felt relaxed and coherent. It was sad to see so many people trying to tap into a source of divine goodness in themselves (where they will never find it) but a joy to tell them it could be found in Jesus alone. 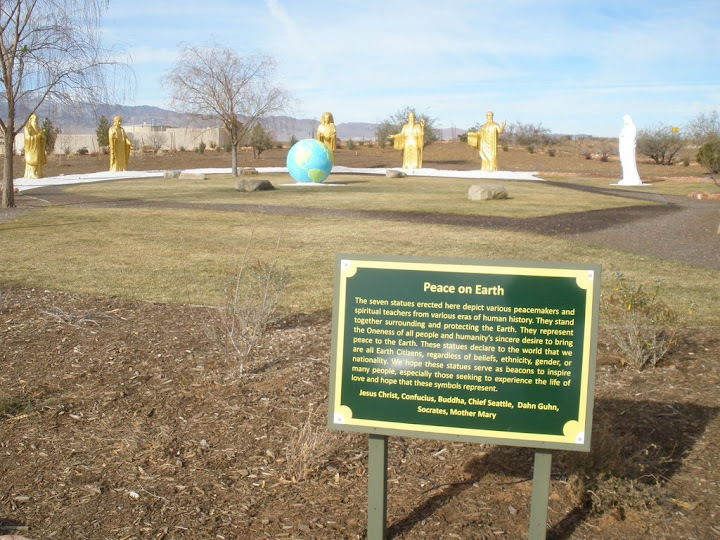 Here is another part of the park, where they have smaller statues of 7 religious figures. As far as I know, we were the only Christians there. I've posted a few more pictures on my photo album. 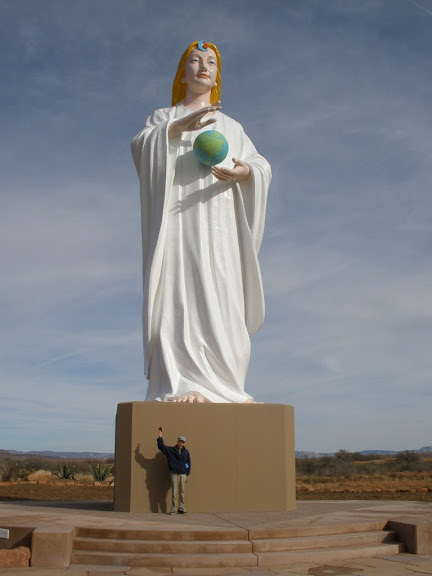 Some local Christians have been upset about the statue's presence. I can understand their concern, but after today, I hope the statue stays. It is like a magnet attracting lost people. They are relaxed and open to talking about spiritual things. An ideal place to share Jesus! For that reason, I've nicknamed the place "Mago Evangelism Park". Jesus, thank You for saving me. If it were not for your grace, I too would still be worshiping idols. Bless the people we talked with today. May they turn from their sins and put their trust in Jesus alone to save them from Your wrath. Help me to love them like You do. Send more Christians to share Jesus with them. Amen! Many people who acknowledge TV's dangers as a time waster and mind polluter nevertheless fear that without TV, they will not stay informed about world events. Understand, I'm not saying watching TV itself is a sin. TV is simply a communication tool. The question is what messages is it giving us? And, apparently TV does not actually work to keep Americans apprised of current events. Pew Research is currently running an online poll, measuring knowledge of current events. Despite the fact that I have not watched TV in years, I scored higher than 93% of other poll-takers. I don't say this to brag (I think many of you will score equally well, if not better), but simply to demonstrate that TV consumption is not necessary to be well-informed. When you see how easy some of the questions are, you too will question how well TV works as an educational tool! We're blessed to be in a church that has bucked the modern trend towards separating people into groups by season of life. I'm glad I had my camera handy yesterday as Michael was pushing Agnes in her wheelchair. If I'd been faster, you would have gotten to see the little girl at right (and her younger brother, who scampered off camera) giving Agnes a hug. It seems that I experience God's hand of blessing more in my work with VOM than in any other area of my life. This is not because there is anything special about VOM itself as an organization. I think it's more because God really cares for His persecuted children, who are joyfully revealing His glory in the middle of circumstances that would crush a non-Christian. This month, another of these "VOMiracles" arrived unexpectedly. David Witt of Spirit of Martyrdom forwarded me a speaking opportunity that he was too booked to take. It turned out to be at the Christian K-8 school in Phoenix where I went to preschool (a looooooong time ago). It was an opportunity to give chapel services for a total of about 420 kids. I have never given a VOM presentation to children before and didn’t want to risk an opportunity this large as my “experiment”. Lu, one of the other Arizona reps, volunteered to take it. The event was scheduled for November 12th. I don't know if you remember me and my sisters but we sang for the VOM conference in Flagstaff AZ in July and then the week after we helped at the Homeschooling convention at the VOM Kids of courage table. I was just writing because I wanted to see if there was any events coming up that we could help at. I am singing at an Arab Baptist church this weekend and I am in charge of the youth revival meeting. I’m going to sing some of my songs there and I'm going to read Kids of Courage stories to them and pray with them about the persecuted church. The family of the girl who wrote this note (from whom I had not heard since July) happens to live in Phoenix. In fact, they happened to live about 2 minutes away from the school where Lu would be speaking the next week! Needless to say, God worked it out so she was able to come assist Lu at the event and Lu was able to give her some further advice on how she can be ministering. Don’t you love how God put all this together? It started with David’s spirit of generosity. He could have tried to get the school to postpone the event to a date he was able to take. Then, God had Lu in place with her experience speaking to children. And who better to give advice to a young woman seeking God’s direction than an older woman like Lu who has walked with God for many years? Ronald Reagan Speaks Out Against Socialized Medicine -- in 1961! This is amazing. Truly, there is nothing new under the sun. The only thing we learn from history is that we never learn from history! See if this message doesn't sound hauntingly relevant for today. Ronald Reagan recorded this in 1961 to help the American Medical Association in their (unsuccessful) opposition to creation of Medicare. On the day when Americans remember the Pilgrims who fled to America to escape religious persecution in England and secularism in Holland, many Muslims will be making pilgrimage to Mecca. This year's Muslim Hajj happens to fall from November 25 to 29. Let's use our Thanksgiving holiday to pray for God to open the eyes of Muslim pilgrims. Here is a short video with details, and here is a PDF. It's been a while since I've given you all an update on Mom. She seems to have reached a plateau of sorts, where she is neither getting worse nor getting better. Through the daily combination of oil of oregano, magnesium oxide, back massages, resting in the recliner, and incredible quantity of prunes, dates, and raisins, she's been able to force her reluctant colon to keep moving. It appears she has developed a painful dental cavity because of eating so much fruit and not being able to brush her teeth often enough. She has a dentist appointment for next Monday. Getting into a dental chair (and staying in it long enough to get a filling) may be tough for her, so your prayers continue to be appreciated! Some days are worse than others. Nevertheless, we're grateful for each new day with her. By God's grace she's been able to spend some of her strength ministering to others in the middle of her own suffering. On Sunday at church, I discovered just how well suffering can prepare for ministry. A bubbly older woman with a cane greeted me. I had first met her on Sunday the 8th. I was embarrassed to discover that she remembered my name while I had forgotten hers. Even more impressively, she remembered that I had not been there on the 15th. I explained that Dad and I take turns staying home with Mom. After the service as she was leaving she said, "I hope your Mom has a good week." I was immediately struck by how perfect these words were and wondered why I had never thought to say something like that to others who are going through times of extended pain. A person unfamiliar with long-term illness would normally say, "I hope your Mom gets well soon." But in these situations, one doesn't normally think ahead more than a week (or even a day, at times). There are good days and bad days and they can change either direction quickly. Her wish for a good week touched us right where we are living. Then I found out why her words were so appropriate. And why her bubbliness was not fake. She is caring for a man in the final stages of cancer. And the man is her ex-husband. This month I discovered ChristianAudio.com, a site which sells recordings of various Christian books. Each month they offer one title for free, and this month's is John Piper's classic, Desiring God. Although I've read other Piper works, I had never read this one even though I knew it was his first (and most popular) work. When we worship God out of duty rather than delight, it exalts us and dishonors God. It basically says, "God is boring, but I'm such a spiritual person that I can worship Him in spite of His shortcomings." Besides saving us from the penalty, power, and presence of sin, Jesus also saves us from the pleasure of sin. Becoming a Christian means not only receiving Jesus as Savior and Lord, but also as Treasure. It really makes you rethink things. Using the word "hedonist" in a positive way is a really hard thing to get your mind around, but Piper does a thorough job explaining and backing up his points with Scripture. Some priceless pictures from my church's Thanksgiving dinner last night. As things turned out, I wound up sitting at the table with six young boys. Apparently the adults thought I was sacrificing by sitting with them. But honestly, it was a great joy. Craig shares what the people at his table are grateful for. Women and children were first, but there was still lots of good food left for the men! Doesn't he look like the farmer in American Gothic? Do Muslims believe Hasan was justified in the Fort Hood shootings? This is a poll only for Muslims to answer. Want to prove to the world that most Muslims are peaceful? Or, would you like to defend the use of lethal force against a military target? Now is your chance. Vote on the poll below. Ask your Muslim friends to vote too. Feel free to leave a comment if you want to explain your position in more detail. Was Nidal Malik Hasan justified in his attack at Fort Hood? I would have shown a picture of Maryam and Marzieh if the church projector hadn't been dead. But that doesn't stop me from showing it to you. For more information on their case, visit Elam Ministries. To write them a letter of encouragement, visit Prisoner Alert. October 31 has a glorious history: it is the day in 1517 when Martin Luther posted 95 theses which would shake the world. It's time we reclaim this day for God's glory. My family's approach to Halloween has changed dramatically over the years. As a child, I enjoyed going to our church's Halloween-replacement event. Later, once my parents realized the pagan implications of Halloween, we ceased observing it altogether. We disabled the doorbell, turned the lights out, and went into a back room and spent time together playing games or reading. Then we heard Ray Comfort encourage Christians to view Halloween as a time to evangelize rather than retreat. "On what other night of the year do non-Christians come knocking on your door?" But then we moved to a location in Rimrock where no one ever comes to our door on Halloween. In 2005 Mom had a three hour doctor's appointment in the nearby town of Sedona on the afternoon of October 31. I got the idea to try to spend those three hours evangelizing in some way while Mom and Dad were at the doctor's office. The morning of that October 31 I got dreadful news: my evangelism mentor Gordon Riffle had died as a result of complications from back surgery. At first I thought of it as a victory for Satan. How awful, I thought, to die on a day that celebrates evil and death. After I dropped Mom and Dad off at the doctor's office I almost chickened out. I had no idea where or how to find people to talk with. 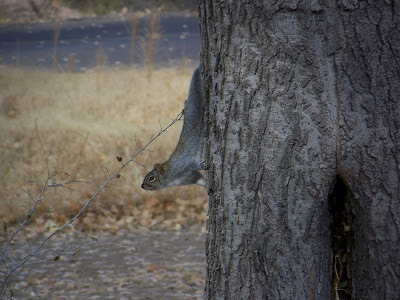 But something gripped my gut and I decided I would do my best in evangelizing in Sedona that evening, in honor of Gordon's investment in my life. (And, I didn't want to have to tell everyone who was praying for me that I'd backed down!) The story of how God guided me to Sedona's Halloween celebration that year is too long to tell here, but suffice it to say that it was one of the best evenings of my life. We've gone back to Sedona for Halloween almost every year since then. This year was a bit different: Mom was physically unable to come, and Dad stayed home to care for her. However, two leaders from church, Jim and Travis, joined me there for the first time. I parked next to a car with a bumper sticker that read "Prayerfully Pro-choice". That epitomizes Sedona: spiritual, but lost. Jim, Travis and I prayed together. There is nothing quite like the camaraderie of bowed heads on a street corner just before sharing Jesus. We walked down the sidewalk, looking for people to talk with. I found a man just standing and watching the passersby. "Do you believe in ghosts?" I asked. "I haven't seen any, so, no." "Then where do you believe people's souls go when they die?" "Do we even have souls?" "So, you believe we're just chemicals?" I responded. "No, I think we're just illusions." "I'm talking to an illusion?" I asked. "Well, you're an illusion too." About then his wife came out from the shop behind him to see what I was doing to her husband. I said, "I asked your husband if he believed in ghosts and he told me that we're all illusions. I guess that means we're all ghosts, right?" We all laughed. She told me he was probably pulling my leg and then told him she had something to show him in the shop. I caught up with Jim and Travis, who were watching from a distance. As we waited for the street light to change so we could cross, I started a conversation with a man and woman near us. They turned out to be from the Toronto area, and this was their first visit to Sedona. Jim jumped in boldly. "Do you believe in God?" "She does," the man answered. As we crossed the street, Jim asked her, "If you died tonight and God asked you why He should let you into heaven, what would you say?" "I've been a good person!" I moved away from the conversation (unfortunately, out of earshot) so as to avoid making the Canadians feel like we were ganging up on them. Down the street, people were lining up to watch ghosts dance. I approached an older couple who had moved to Sedona recently from San Diego and repeated my starter questions. The man said he didn't know where people would go when they died. Unfortunately here I have a memory lapse: I don't recall exactly what happened to the conversation except that I gave up and moved on. I wish I had tried a little harder. My next conversation was with a friendly store owner outside for a smoke break. He lightheartedly answered my first question with "I think ghosts might exist" but when I asked where he believes souls go when they die, his eyes narrowed and he said, "I think that's a personal question." I tried asking it slightly differently and got the same response. Alas, again my mind was dull. I could have kept the conversation going by saying, "It sounds like you've had people try to shove religion down your throat." Instead, I moved on. I found a man sitting alone on a bench. He looked bored, and I told him so. We chuckled and we started talking. Amazingly, he was also from Toronto. "Where do you believe souls go when they die?" "Did Hitler have a soul?" I probed to find what standard he felt people must meet to enter heaven. "Do they need to be as good as Mother Teresa?" "No. God is compassionate, He wouldn't send the majority of His children to hell. He knows that we all mess up. We must simply treat people fairly." I kept probing, looking for his standard for morals. "You say that we should treat people fairly. Some say that an unborn baby is a person. Some say it's not. So, when you say we should treat people fairly, would you include unborn babies?" "I'm a Catholic, so, yes, I would." "I agree with you," I said, "But where are you getting your standard from?" "Well, the Ten Commandments are a pretty good place to start." When I went through a few of the commandments with him, he continued to justify himself as being a basically good person. I switched to a different approach. "Why do you believe that Jesus had to die?" "Because the Jews didn't like Him," he answered. "That's a reason why He died, true. But at the same time, God could have prevented them from killing Jesus. Instead, He allowed it. Why?" He didn't seem to understand my question and said something about the Jews again. I decided to tell him the answer. "Because of the ways we have rebelled against God, we deserve judgment. He must punish sin, He can't just ignore it or grade on the curve. God gave Jesus the punishment we deserve. Jesus had to die because that was the only way God could forgive us and still be righteous." About then his wife came up. He looked glad for an excuse to get away from me. I moved on to a shop that sold dreamcatchers. I knew they were called dreamcatchers but I didn't know why. Here's a picture of one, in case you don't know what they look like. "Why are they called dreamcatchers?" I asked. 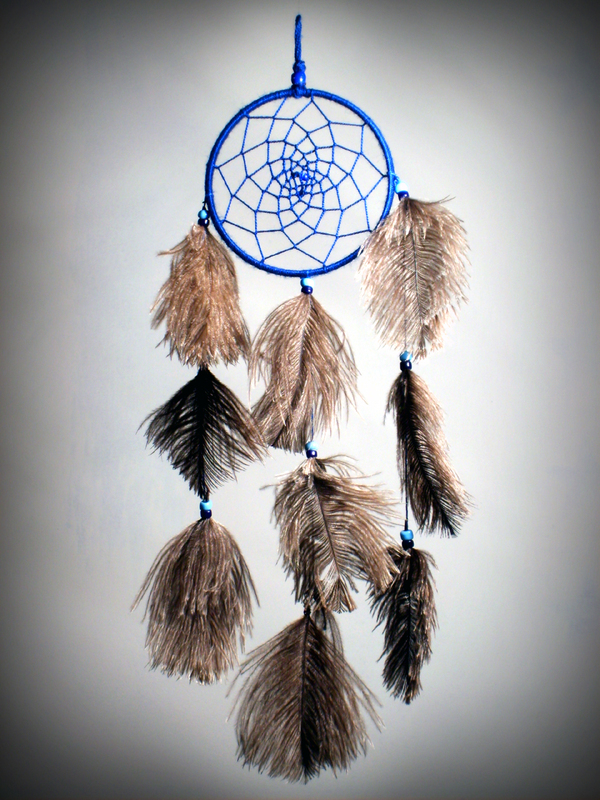 "Because they catch bad dreams," the shop owner answered. Interestingly, he was white, not native American. "Really, do they work for you?" "Actually, I don't use one! I don't have many bad dreams," he chuckled. Pointing to the hole in the center of a dreamcatcher, he said, "The good dreams go through here." "So good dreams are smaller?" "Well, you might say good dreams are smarter. They find their way past the strings, but the bad dreams get stuck in them." Suddenly my heart jumped for joy: Jim and Travis were talking with Woody! I have talked with Woody on two previous Halloweens. He is one of the most colorful characters I've met, and I had told Jim that I hoped he would get to meet Woody. I went up and greeted Woody. "Did you read the book I gave you last year?" "No, but I got my logo done!" I scrambled to remember what logo he was talking about. "Great!" Classic Woody. I left Jim and Travis with him, knowing that it could be a long conversation. I next talked with a young man with a sore throat. He was surprisingly open and uncertain in his beliefs, and recognized his sinfulness fairly readily. But my words seemed to come out too slowly and foggily. Before I got to explaining the gospel, his friends came up and said, "Hey, are you coming with us, or do you want us to wait for you?" He opted to go with them. All along, in between conversations, I had been handing out "Are You a Good Person" tracts to the adults and 10 Commandments Coins to the kids. I was doing this again after the young man left. A middle age woman with some kind of official badge saw me giving coins to kids and came up and asked what they were. I told her they were the 10 Commandments. She told me I couldn't give them out, because I wasn't a store owner. (The store owners along the road were giving out candy to the kids.) But she kind of gave herself away when she said something about, "If they weren't religious..."
"Isn't this public property?" I asked. She agreed that it was but then reiterated that I shouldn't be giving the tracts or coins away because I wasn't a store owner. By then I realized that she was basically expressing her own personal desire, not a legitimate law. Many police officers had already seen me distributing tracts that evening and had made no attempt to stop me. I thanked her for the information, got out of her sight, and kept on distributing tracts. The next conversation I had was with a group of Goth teens. I asked them if they believed in ghosts, and one guy said, "Yes, I believe in everything." Trying to show him the absurdity of such a statement, I asked if he believed he was a pumpkin (I just pulled 'pumpkin' out of the blue, he was not dressed as a pumpkin). He said yes. Once again I gave up on the conversation and moved on. A young couple from Yuma were waiting for the ghosts to start their next dance. When I asked where they believed souls go after death, the woman said, "Heaven". "You know, in God, and that Jesus died on the cross for their sins." "Did you just read that in the tract I gave you?" It was pretty obvious that they were not true followers of Jesus, but once again I was not quick enough to think of a response to deepen the conversation. Again I moved on, but that was essentially the last conversation I had before heading home. Jim, Travis and I debriefed about our experiences. This was Travis' first time in street evangelism (hurrah!) so he accompanied Jim to learn the ropes. Jim had had a number of good conversations; the best was with a young man from Norway. Jim was also thoughtful enough to learn the names of everyone he shared with, so that he could pray for them by name afterward. I felt badly that I had not been more "sharp" spiritually to get further in my conversations. At the same time, I praised God that I had any conversations. A few years ago, I was scared to talk to people about Jesus at all. As I drove home that night and thought about the hundreds of people that we had not had time to share with, I couldn't help but pray that God will send more Christians out to share the good news. May fear of man waste no more of our days! My mother and I are both on wheat-free diets, due to possible sensitivities to that grain. If you've ever been on a wheat-free diet, you know that there are a number of other less famous grains that are well-tolerated by most wheat-sensitive people. Among these is the tiny grain amaranth, which now makes regular appearances on our table. We even attempted growing amaranth about 10 years ago. Terrible idea. The seeds are so tiny that it's nearly impossible to separate them from the chaff by hand. Trust me, buy it in the store! Another form of the word, "amarantos" is used by Peter back in 1 Peter 1:4 to describe the "unfading inheritance" which awaits all followers of Jesus. What a great promise! But there's a negative side too. Some things do "fade away". If you know much about word origins, you know that the prefix "a" often means "not". Such is the case with "a-maranth". The "maranth" (or, in Greek, 'maraino') has a broad range of meanings related to 'wasting away'. This word, maraino, is used only once in the New Testament, in James 1:11. These three verses form a challenge to us to invest our lives in things that will not fade away. Dad stumbled upon this video demonstrating what can only be called an amazing domino chain reaction set up by Tim Fort. In addition to amazing, it is also tragic. It's tragic because the Minnesota state government has actually awarded the creator an "Artist's Initiative Grant" to further fund his work. But it's more tragic because God created Mr. Fort for far greater works than these. When he stands before God to account for his life, Tim's skill at creating amusing chain reactions will be a weight, rather than an ease, to his conscience. Before we pass judgment too severely on him, we need to take a look in the mirror. Compared to Mr. Fort, perhaps we use our skills wisely. But compared with God's goals, I'm afraid many of are pursuits are still quite trivial. Need a Google Voice Account? I've been using Google Voice for a while now, and it is really quite nice. It has a lot of very helpful features (click here for a list). Google is only slowly allowing new users to get Google Voice, so that the service is not overwhelmed all at once. However, they've given me three (3) Google Voice "invitations" (like a free ticket) that I can give away to three friends. If you feel Google Voice would be handy for you, let me know. I'll try to give away my invitations to those of you who can use it best. So Peter was kept in the prison, but prayer for him was being made fervently by the church to God. Remember the prisoners as if chained with them—those who are mistreated—since you yourselves are in the body also. When they had been released, they went to their own companions and reported all that the chief priests and the elders had said to them. And when they heard this, they lifted their voices to God with one accord… And when they had prayed, the place where they had gathered together was shaken, and they were all filled with the Holy Spirit and began to speak the word of God with boldness. Because of the service by which you have proved yourselves, men will praise God for the obedience that accompanies your confession of the gospel of Christ, and for your generosity in sharing with them and with everyone else. And in their prayers for you their hearts will go out to you, because of the surpassing grace God has given you. Most of the brethren, trusting in the Lord because of my imprisonment, have far more courage to speak the word of God without fear. The International Day of Prayer for the Persecuted Church (IDOP) is November 8 this year. For more ideas on designing an IDOP segment for your November 8th service, or if you would like a VOM speaker to come to your Sunday School class, Bible study, or worship service, please contact me. Mom finished her week of intensive Rifaximin antibiotic therapy on Sunday. We've been waiting to see the long term results. We can definitely say that Rifaximin caused no negative side effects, which is a blessing in itself. About the same time she started taking a product called Fruit-Eze, which is a blend of prunes, dates, raisins, and prune juice. Although she had (of course) tried prunes before, for some reason this particular blend seems to work better. Lastly, she's found that if she spends more time in her recliner chair it seems to take pressure off her colon and allow food to move around somewhat more freely. So all of that to say that for approximately the last week and a half she's been able to go to the bathroom more regularly, although still not normally. Exactly how much is due to the Rifaximin, the Fruit-Eze, the Mag Oxide, or the recliner we don't know for sure. We're grateful to God for the improvement, however slight. Your continued prayers are greatly appreciated! I quickly came up with -2.96 using my cell phone calculator and basic math skills. Even though I tried to explain to the tech how I did it he didn't trust my figure, and even though he had a very nice scientific calculator he still couldn't figure it out himself. Eventually the poor guy got some help from another tech, who after several minutes found how to use the scientific calculator to arrive at the same -2.96 figure. They actually gave me my money back, which I thought was nice. My heart went out to them. To any kids who might read this: obey your parents and learn your math. Not learning it may someday cost you money (or perhaps even your job). Thousands of third world kids would love to have the educational opportunities you squander. Thanks, Mom and Dad, for the countless hours of math teaching you gave me! When Dad was at Wal-Mart last Saturday picking up the antibiotics for Mom, the cashier told him, "If you go to SavonRx.com, you can print out a free prescription drug savings card. I've seen people save up to $100 using it." The next question was whether the card actually would work. Fortunately, Dad only picked up a few pills on Saturday, enough for Mom to try to see if she would have an adverse reaction to them. She tolerated the pills well, so on Monday he went back to Walmart to get a bunch more of them. He presented the card, and it cut the bill by about $20, which was about 10%. Amazing... and disconcerting! The more I thought about this, the more disturbed I became about our health care system. If you can get 10% (or more) off the cost of drugs just by having a free piece of paper, why not just give everyone the 10% discount? Then I started wondering how many people think Jesus is like this card. They think God is an eccentric deity who charges a ridiculously high price (perfection) to get into heaven. But because He knows the price is too high, He offers a free "Jesus card" that gets anyone in. Sort of like a car dealer who inflates the sticker price so he can give you a "deal". Such a distorted view eventually makes God seem gimmicky for the "saved" and unjust to the "unsaved" (how could God send anyone to hell just for not having a "Jesus card"?). How would you explain the real Jesus to someone who thinks He's a "pass card"? On Saturday Mom started on the antibiotic Rifaximin as a treatment for small intestine bacterial overgrowth (SIBO). We are making something of a guess that she has SIBO. We have a few clues that point that way: the urine test which showed waste byproducts of clostridium and other “bad” bacteria; the stool test which showed no bad bacteria in the large intestine, and the presence of unusual amounts of gas, which is a bacterial byproduct. She also got results back on a very comprehensive food allergy test last week which shows that she is only allergic to surprisingly few foods (dairy, peanuts, broccoli, and a few others). She hasn’t been eating any of those things anyways. Since she’s given the herbal antibacterials a couple weeks to work already (without much results), and since she is getting so weak, she has decided to try a high dosage 7-day round of Rifaximin. If you are really interested in medicine, you can click here and then click the "full text" link to read a study describing its use in treating small intestinal bacterial overgrowth. There is still the possibility that her intestinal problems are neurological rather than bacterial. We know she has some kind of spinal compressions going on in her spine – her spine has curved noticeably in the last few months. It could be that this spinal deterioration is resulting in intermittent signals making it to or from the intestines. This could cause lack of movement (peristalsis) of the intestines. This, in turn, could have allowed the right conditions for the bacterial overgrowth. If so, there is essentially nothing that can be done, and this round of antibiotics will provide only temporary relief, if any. However, it certainly seems to be worth a try. This drug reportedly has few side effects and is quite effective at knocking out a broad range of bad bugs. So far, it is too soon to know but we should know within a few more days. Thanks for your prayers. Well, I just learned one bad thing about PalTalk. They only allow you to use Paltalk Express for 5 times for free. Then you either have to either live with the advertisements in Paltalk Scene, or pay $39.95 a year for ad-free access to Paltalk Scene and Paltalk Express. I think I may go ahead and pay the money. Paltalk seems to be a powerful tool for communication; despite the cost, it is still better than Skypecasts in many ways. At last, a replacement for Skypecasts that seems to work! I learned about Paltalk a few years ago but couldn't stand the advertisements and I didn't want to pay for the ad-free version. Today, a Muslim friend showed me that the browser-based version of Paltalk (called Paltalk Express) doesn't have advertisements. For a browser-based communication program, it works extremely well. I was able both to hear and speak with no breakup or garbling. Paltalk rooms are clearly organized by category (and you can block seeing any adult rooms, unlike Skypecasts). Room "owners" can designate other friends as "administrators" to keep the room moderated while the owner is away. You can play MP3 files to your "audience". My Paltalk ID is "Godismyjudge". Feel free to add me as a "Pal". And to Tony and Milio who tried to get me into Paltalk a long time ago: sorry guys, it looks like you were right! 24 Years Ago, Our Trip Across the Country! In retrospect, I had an almost idyllic childhood. The only thing bad about it was that it was so pleasant. This perhaps made "growing up" harder and slower for me. But yet, when I hear of and see children so much less fortunate than I was, I thank God for the parents He gave me and the upbringing they gave me. Here is a recording we made on cassette while driving across the country in 1985. Dad worked for IBM, and IBM gave him the chance to work for 3 months at the tech support center in IBM's "birthplace", the Endicott, New York area. He scheduled his vacation time around the temporary assignment, and we took several weeks driving each direction, stopping often at educational and historical sites. If my memory is correct, by the time I was 8 I had been in over 30 states. The only thing more amazing than this trip was that God gave us the opportunity to do the same thing again (taking different routes each time) in 1987 and 1990. We also returned to Endicott in 1992 but took a plane both ways. I've now been in 43 states. The best of men are men at best. One example of this sad truth is Pastor Ichabod Spencer, whose stories I featured in a blog post last week. Ichabod Spencer was a wonderful and caring shepherd who sought lost people with a carefulness seldom seen today. And yet, he had a blight. Not a blind spot. Not a blemish. This was a blight. For when the Fugitive Slave Law of 1850 was passed, Ichabod Spencer preached, and later published as a booklet, a sermon denouncing those who resisted this law. Building his case solely on Romans 13:1-7 and Titus 3:1, he adamantly insisted that obedience to the rule of the law of the land, including the Fugitive Slave Law, was every Christian's duty. The Fugitive Slave Law severely penalized anyone caught helping an escaped slave. It was part of the Compromise of 1850 that Congress passed in a Neville Chamberlain-style attempt to preserve peace at the expense of righteousness. The Fugitive Slave Law actually backfired and greatly contributed to the outbreak of Civil War, because it forced every Northerner to decide between helping escaped slaves and breaking the law, or obeying the law and allowing escaped slaves to be captured and returned to the South. And Pastor Spencer came down on the wrong side of this, the most serious social issue of his day. His sermon never once mentions Deuteronomy 23:15, which clearly commands, "You shall not hand over to his master a slave who has escaped from his master to you". This is unconscionable. He was not alone. Sounding Forth the Trumpet cites a statistic from a secular abolitionist of the day who said that less than 1% of the North's 30,000 clergymen stood up against the Fugitive Slave Law. Even Abraham Lincoln, when running for president, agreed with Stephen Douglas that the Fugitive Slave Law should be enforced. Rather than causing us to become angry, this ought to frighten us into humility and self-examination. These men were sincerely standing up for the truth as they saw it. Pastor Spencer did a great deal of good in his life. He was a better pastor than many pastors today. And yet, he failed on this major issue. Instead of examining his culture through the grid of Scripture, he used the Bible to justify his cultural presuppositions about slavery. The frightening thing is that it is probable that each of us has imbibed some serious error from our own culture today. Future generations will look back upon us, as we look back upon the Spencers of the 1850s, and wonder, "How could they ever have justified this?" This in turn will cause them to doubt the veracity of even the things that we were right about. What are some specific issues in your culture today where you think Christians have "missed the mark"? Mom said she could relate. Her health crisis is causing her to review her life's priorities more closely. She says, "If I live through this, I will be a different person." May honoring Jesus by saving people from hell be our passion too. The Wretched Segment of the Day - September 16, 2009: " Todd hits the campus with some Aussie help." These two true stories from the memoirs of Brooklyn pastor Ichabod Spencer (1798-1854) are gripping. In them he recounts two of his pastoral visits to people in his community. Oh, that God would once again give us Americans such a deep awareness of the seriousness of sin! By the way, if you enjoy these excerpts, you can read the complete book online for free. Google has digitized an ancient copy of it (obviously, the copyright has expired). You can also buy printed copy, thanks to Solid Ground Christian Books taking the trouble to reprint it in recent years. Over the years, some have questioned my motives in using my business as a tool to promote Jesus. Initially it was my Dad's idea but I have done it long enough now that I recommend it to anyone. Don't let the pressure of political correctness rob you of the use of 40 of your best hours each week to share the good news! Here are a few of the emails (both pro and con) I've received over the years. (Spelling has not been corrected.) I thank the Lord for the opportunity to respond to each of them. Keep up the good work; now if only most of the declared Christians only lived up the human/humane side of the story of Jesus' life, rather than the hyperconservative belief that only Christianity provides a means for the salvation from man's innate (and incorrigible) defects. Again, remain optimistic. Some Christians are indeed human. There is yet hope for humanity. I don't know if there is yet hope for Christianity. I was about to purchase 10 reman toner cartridges from you, when I noticed the "Lord Jesus Christ" link at the top of the page. I have nothing against your beliefs, but am very offended at the fact that you try to push those beliefs onto your customers. Therefore, I will not order, and will not visit your site again. Its amazing to me how lost people in life can just latch onto this incredile book of fables, written for one reaon only. To keep HUMANS in line. Written by other humans, to keep HUMANS in line. It was the only natural response to intelligent HUMANS of the time, in order to devise a way to control, maintain order of, and threaten HUMANS. And one note on conscience. If you were to take 55 infant babies, put them isolated on a desert island, with no contact, no religion, nothing at all but their companions. They inherently would NOT have a conscience in any way shape or form. Would they think it was wrong to kill another? No, they would not. They might realize after killing another, that now that person is gone, and not able to help them hunt, or what have you, but they would not know it was "wrong", and they certainly would not have any idea they are going to "hell" because of it. I am not endorsing murder in any way shape or form, just using it as an example. I realize that you are probably sitting there reading this with a smile, thinking "this poor person is going to hell". Well, I have studied religion for the past 17 years, and these are just my opinions. Yet again, You have lost my business by making your public views of religion available on your website. Its ridiculous and unprofessional....Especially because anyone that really has researched your so called "religion", knows that its laughable, and that the only reason it exsists is because in the day it was written, it was the only tool in which to keep HUMANS in line. Its just a shame its still keeping HUMANS inline, and wasting peoples lives here in 2002.
do you think salvation can ever be lost, i have heard so many conflicting answers to this question. Yes your fax ribbon arrived on schedule. I got it on Saturday. Just as you said it should arrive. Thanks for all your help! As I said before you will see more of my business. Word of mouth s a very good tool. It is something that I do not speak to many people about. (Maybe I should ) Let alone someone I buy a product from. I was brought up with no word of God. Other than the entity exist & you should be a good person. My parents were from India & brought me up with good values & change religion in the middle of my life growing up. If it seems as though I am a bit confused ... it is because I am. I guess we all are or should be ... with everything Humanity has to offer it's very genus .... everything will be lost! Take care Daniel! Best of luck to you. Thank You once again for your expedient assistance! I just wanted to say that you putting that quote on the top of your webpage "Seeking to honor the Lord Jesus Christ in all our business dealings" is totally offensive. Not only to the atheists out there, but also to the Christians. Didn't Christ throw out the merchants that were in his temple? And now you're doing the same thing the merchants were. Nice Job, Well done, what a surprise in a world that either ignores Christ or that uses their Christianity for some deceptive reason to find one that simply offers the truth with no apparent gain than to honor Him. I have been in business for over 27 years and have seen many things. But I wanted to take a moment to let you know how enlightened I was to see you proclaim your love for Jesus in your business website. I commend you on your openness and pray that your disclosure will help those who question the existence of God. Hello, I was browsing PayPal and you printer ink cartridge business was featured at their website after I logged out. Since I have started a small computer business and since last March-2003, I enter your website and found a link to your site. I hit the link to request a prayer and happen that I need God to help me. I have another job, working hard to grow my computer business so that I can leave the other job and devote all my time to my small company. Things are getting tough at my full time job, I am not ready to lose it but things are getting tough for the company and some layoff may happen that affects me. If this happen, it will be too premature for me to deal only with my computer business to make a living. I have also a girl 3 years old and my wife is 7 months pregnant and I am the only one working at home. Please say a prayer for me and my family. I read the bible every night and I recognized that I have forget my christainity since I was born and raised i n a christian home. I need guidance, hope, more self esteem, motivation and faith. I came looking for an answer to a Toshiba question and found myself inspired by your direction of thought and energy to older folks and our lord. It has been brought to our attention that email's sent by your company contain material that may not be considered appropriate by certain individuals here at our company. We respectfully request that you remove any reference to religion or solicitations for your personal website from any future correspondence you have with our company. i found your webpage by doing a search for cheap epson C40 ink or something like that. i needed some more ink! i did some price comparisons, you were not the cheapest, but the cheapest ink is a bit scary anyways. then i saw you were a christian, and i am a christian too, so praise God. anyway i figured better to do business with a christian, so thats what i did. what a strange web-presence you seem to have... a lot of christian evangalism, and then you sell ink on the side???? how does that work!? have you heard from anyone who has been challenged by some of the things you have posted on your webpage? It's been a while since I've updated you on Mom's health struggles. That isn't because she hasn't been suffering, but because the news seems to change with bewildering frequency. One nutritionist told her she should go on IV nutrition, but that's not as simple or risk-free an option as one might think. And (praise God) she was actually able to somehow put two pounds back on last week. We thought we were finally getting somewhere last week when a state of the art urine test revealed high levels of byproducts of intestinal bacteria and yeast. We eagerly awaited the results of a stool test (from the same lab) to find out specifically which bacteria and yeast were causing the problem, eager to begin "attacking" them. The stool test results came back today -- and to our surprise, showed essentially nothing wrong! So, in effect, the stool test and the urine test contradict each other. So do her symptoms. Occasionally now she's having diarrhea, but it reverts back to painful constipation with amazing speed. Keep praying. She's walking a tough road. Thank God every day that your intestines work halfway normal! This YouTube video is quite graphic, especially toward the end. I don't recommend young children watch it. The combination of scenes of Christian martyrdom with a beautiful performance of "For All The Saints" is striking and sobering. On a day when we remember 19 misguided hijackers who thought they would be considered "martyrs" by God for their actions, it's helpful to be reminded of what martyrdom really looks like. Here are the complete set of words to "For All the Saints" (the video is so engrossing that it's easy to miss the words). When we look back at those who have gone before us, we see what an amazing privilege and responsibility it is to be called a Christian.